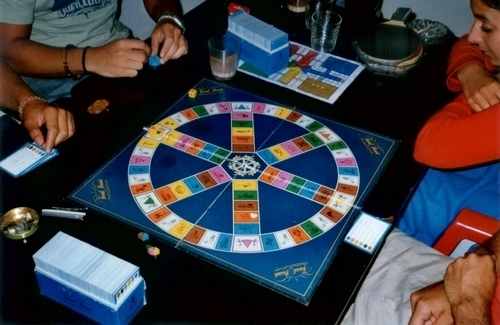 There are hundreds of games based on answering questions (Trivial Pursuit, Jeopardy!, Scene It?) and hundreds more that incorporate trivia questions as one element of a more complicated system (The Weakest Link, Crossword Puzzles, Wits & Wagers). But if you tilt your head just right, it’s easy to see a trivia question as not just a piece of content in a game but a game in of itself. In other words, writing a good trivia question is the same as creating a good game . Of course, it’s a little reductive to suggest that all of the pleasure we get from games is derived from a neuro-chemical addiction to learning, and Koster acknowledges many other pleasurable feelings that games excel at evoking . But unlike most video games or board games, a trivia questions is all about mastery. Answering a good trivia question makes you feel smart, and the act of struggling to answer one is satisfying the way struggling to score a soccer goal and line-up a shot in Golden Eye is satisfying. This is the job of the trivia writer: making people feel smart. But writing a question that makes people feel smart isn’t as simple as it seems. It’s obvious that you've failed if a question is too hard for anyone to answer. On the other hand if a question’s too easy, no one will feel smart when they get it right. Good questions land somewhere between “Who’s the first president of the United States?” and “What’s the first name of the first president’s father?” The challenge for the question writer (or game designer) is to find the happy medium between these extremes. The most satisfying fun comes when players can figure out (or guess) the answer to an unfamiliar question. It’s impossible for every question to hit this sweet spot, but when you play a pub trivia with friends or watch a quiz show on TV, the goal is for the mix of questions you hear to make you feel smart often enough to keep you engaged. It’s important to know your audience, but it almost impossible to strike this balance by merely identifying what information is just barely obscure enough to make a good question. Instead of just asking players to identify a piece of information, trivia writers use tricks to help turn information into good trivia. Most of these tricks boil down to making a question more like a puzzle, increasing the chances that player brains can run through pattern identification and identify an answer that satisfies the desire to feel smart, even if a player wouldn’t know the answer if it were asked straight. The multiple-choice question is a mainstay of game shows like Who Wants to be a Millionaire, video games like You Don’t Know Jack and standardized testing. There are questions that no one could answer without choices, that become a deductive challenge when presented this way. “Well, I’ve never heard of A, but I know it’s not B, and C doesn’t seem right.” More importantly, multiple-choice questions always allow players to guess. There’s no fun in saying “I don’t know” every turn, and limiting choice guarantees that everyone can take a wild guess. Forcing people to do nothing turn after turn is real drag on player agency. Even when writers don’t give explicit options, they can narrow down the range of possible answers. Instead of “Which animal…” they can ask “Which mammal” Limiting options also gives designers a lot more control since they can make the other options more or less appealing to dial the difficulty of a trivia question up or down. Writers can also provide clues and information from outside the question. Categories are a trivia question mainstay. In addition to giving players a sense of meaningful choice about what questions they’ll be presented with, categories often provide clues that make otherwise unanswerable questions approachable. Categories on game shows narrow in on very specific areas: answers beginning with a single letter, state capitals, colors. Once a player knows what they’re looking for, the question itself needs less information. This is also why crossword clues can be so much vaguer than other trivia: the restrictions of the letters in the grid ensure that players will have other information to go on. Another fun example is online Kennections quiz written weekly by Jeopardy! champion Ken Jennings . The weekly quiz features 5 seemingly questions, but there is a connection between all 5. Once you’ve answered 2 or 3, a pattern begins to emerge and it becomes possible to take a guess at a question you’ve never heard before.